When animals speak to us, they speak to us in this way. There is no hidden agenda. They communicate with each other on this level all of the time. It is natural to them, like breathing. Animal communication is something that we are all able to do. We forget what is so natural as we reach adulthood. As we age, we discount what the animals say to us. We will say we have an overactive imagination or that it is not possible. Ironically, it is possible. In order to communicate with animals telepathically, follow the simple steps in this article. It is essential in order to do the exercises that you begin to keep a journal. You will need to do this to record your journey. Before we begin, let us discuss different types of psychic awareness. You will need to understand these in order to understand the different types of messages you will be receiving from your own animal companions and others. Clairvoyance. Second sight is another term for this. It can occur in a few different ways. The animal may send you a picture of its favorite bowl or toy. You may see a picture/vision of a past life or its current life. You may be allowed to see through its eyes/perspective. You may see a symbol that represents something specific. You may move through the animal’s body seeking the cause of a physical problem as well. Clairaudience. This is the ability to hear things that are beyond the range of ordinary hearing. The animal may actually speak to you in words. Empathy. You feel the emotion, you feel the physical pain. It is as simple as that — a feeling or knowing that it cannot be you, so it must be the animal. You may also experience the world completely on the animal’s level. At times, you may smell what it is smelling or fly as it flies. It will show you its world. Marcia and Tucker Herman communicating. The best way to do start is to go to a quiet room where you will not be distracted. Either have the animal or a picture of a friend’s animal with you. Quiet and still yourself. You can close your eyes. When you feel ready, open your eyes and begin to focus on the animal or the animal’s picture. Begin to observe the animal. Notice the fur, the body, and the eyes, the breathing. Move deeper if you can. What do you notice most about the animal? Is it the way it moves, breathes, or looks at you? Write down any impressions in your journal. If your thoughts are running rampant at this point, do not fret. Here are some tips. Be patient with yourself. The more you practice, the easier it will become. In order to set the mood you may want to use soft background music, which may or may not include light drumming. If you do not have background music available, try listening to the beat of your own heart. There is no specific criterion as to how long to stick with the first exercise before you proceed to the second. You will know when you are ready to advance. Everyone is different. When you open your eyes this time, say “hello” to the animal. You may experience the following: a feeling, a vision, a vibration, a voice, a smell, or a combination. Write down anything you may get in your journal. The next step is asking a simple question. What is your favorite color? What is your favorite toy? Continue writing down anything you may get in your journal. There are none. Where you go from here is entirely up to you. The more you practice you will find that you may be speaking with a cat on a matter of philosophy or perhaps connecting with a beloved pet who has died. Over time, you will find you do not need to have the animal with you or a picture available. All you will need is the animal’s name and species. As time moves on your gift will change and grow. I now see the guardian spirits that walk with individual animals to whom I speak. They come to aid in whatever needs to be addressed, either a health issue, behavioral issue, things of that nature. When I first started, I saw pictures or symbols in my head. I had a knowing or a feeling about something at times. At times, I now get actual words, visions, and smells. Animals can communicate on many different levels as we all can. Look around your house. You can use your own animal companions. Ask friends, co-workers, or relatives. As you begin to branch out from your own pets, explain to your friends, co-workers, and relatives that you need the practice and ask that they try not to trip you up or humiliate you. What you are seeking is honest validation of what you are doing. Animals do not have a problem speaking to us. At times you will be communicating with the animal’s person. Please remember to get permission from an animal’s person before you speak to their animal companions. You will get nothing at times. It may be that the animal does not choose to speak with you. Animals are much like us. They have their good days and bad. Some can make you feel quite out of sorts. A cat I once spoke to enjoyed playing tricks on me. He would hum a little ditty, and when I would ask him a question, he would give me a picture. Because I knew his person, it was the complete opposite of what was fact. Plain and simple, he was a practical joker. Emotions can be a problem. If you are very subjective about an issue, a situation, or a particular animal it may not be possible to get a clear message. It is okay. A dear friend’s two Greyhounds were killed by a car. 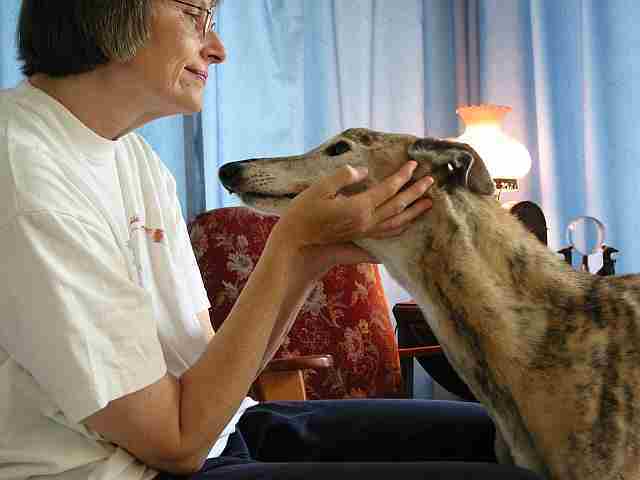 Her third Greyhound was missing. I called another animal communicator to help locate the third dog. I was too upset. You may not understand the message either. A Greyhound once mentioned a word to me in a foreign language. This dog was not doing well at all. She was at an animal hospital with a possible cancer. However, the tests had not yet come back. I went racing to the local library for answer. I went through all the “English to you-name-it foreign language dictionaries,” until I found the word and the meaning of it. It meant “underworld” or “passing over.” The dog died that night on her own. Other animals have sent messages to me that were indecipherable. The only thing I could do was relay what I saw and hoped the animal’s person would be able to figure out the significance. Behavioral problems can be resolved. We ask our animal companions to live in an unnatural environment —ours. Unfortunately, what is natural for them is completely unnatural for us. When dealing with your own animals’ or other pets’ behavioral problems, you can usually get a sense of why something is happening. A friend asked me to speak to his dog about his running away. The dog revealed a few things to me. My friend would turn the dog loose at the dog park. The dog would be having such a good time he would not want to return. My friend would go chasing after the dog, and the dog thought this was quite entertaining. In addition, as soon as he caught the dog, the leash was snapped on, and they went home. The fix for this was simple. Teach the dog to “come” on command. This is known in obedience circles as the “recall.” I told my friend to sign up for a good obedience class or work with a professional trainer. As my friend began teaching his dog, I told him to begin visualizing the dog coming to him. It’s ironic, but many times people will ask a dog to “come” but visualize the dog taking off for parts unknown. No wonder the dog is confused. As the dog progressed in his understanding of the recall, I made another suggestion. I asked him to call his dog to him at the dog park, but to allow the dog to go back and play. In this way, the dog would realize that the recall did not always mean the end of play time. An animal communicator sometimes has the ability to explain a situation to the animal and soon resolve the problem by the simple communication. But in most cases, it is also necessary for modification of the animal’s person and modification training of the animal. A variety of disciplines usually work to resolve behavioral problems if they are not organic in origin or if the problem is not idiopathic. Always contact a trained professional or veterinarian in dealing with behavioral problems such as aggression. Determining illness is an important use for communication. When you speak to an animal to find out what the problem is, remember the animal may or may not know what it is at a particular time. Take into consideration that I have been given visions of specific areas of the body with a variety of colors, symbols, and a general sense of where the problem may be. I have relayed this to the animal’s person. At times, I have felt pain in a given area. There have been times I have been led through the animal’s body (the best way to visualize this is imagine a scope moving through the body) and if anything seemed to stand out, it was mentioned. Recently, one of my Greyhounds hinted his problem to me by allowing me to see through his eyes. One of the eyes was slightly blurry. I must admit, I still doubt at times and when Tauri stopped complaining, I had pretty much decided that everything was fine. It was not. He was diagnosed with an eye affliction (pannus) a few weeks later. This was a difficult lesson for me to learn. If you sense anything during an illness scan you must say something to the animal’s person and advise them to get veterinary care as soon as possible. If it is one of your own pets, promptly get to the veterinarian. Always rely on the veterinarian’s diagnosis. Remember that animal communication is not a diagnostic tool. Pets sometimes prefer naming themselves. When we get a new animal companion, most of us spend much time trying to find the right name. We pore through baby name books; sometimes we even choose the name before the animal companion arrives. Try this. Allow the animal to assist you in the naming process or see if the animal will name him or herself. Allow it to tell you. Spend some quiet time with the new one. Perform the Meditate, Focused Observation, and Connection exercises. Ask the question, “What is your name?” My Greyhound, Feather, showed me a quail feather floating through the sky. Hence came her name. Magi, my Australian Shepherd, told me his name in a vision when he was three days old. Shoney Cat, when asked the question, jumped into the sink and started playing with the water dripping from the faucet. I grabbed my book of magical names and started reading them aloud. I came upon Shoney: Celtic water god. I stopped and looked at him. He looked back at me and said, “Yes.” These are just a few examples of how animal communication can help you and others. You will find more. Enjoy and celebrate the connection. All of the publications can be ordered through your local bookstore or through Amazon on line. I read your article and found it very interesting. I have two Greyhounds (Jada and Luna) that I hope are names they are happy with. 🙂 I am concerned about a friend who has a Greyhound (Shayna) who has a problem with her leg (I think) and there has been no luck diagnosing the problem. She said there is one more test and if that doesn’t come up with anything that she will have to put her down. This is disturbing to me because Shayna is still a young hound. I suggested that she contact Sonya Fitzpatrick a few minutes ago. Then I happened upon this article and just had to ask if there is a way for you to ask Shayna if she can help explain what the problem is. Can’t hurt to ask.